Vegetarian lunch is served: A vegetarian meal at P.S. 244 in Flushing, Queens. Braised black beans and plantains. Tofu roasted in Asian sesame sauce. Falafel and cucumber salad. These aren't menu items from a high-end restaurant; they're lunchtime grub for students at a Flushing, Queens, public school's all-vegetarian cafeteria, the first in New York City to nix meat and believed to be one of the first public school in the nation to serve only vegetarian fare. P.S. 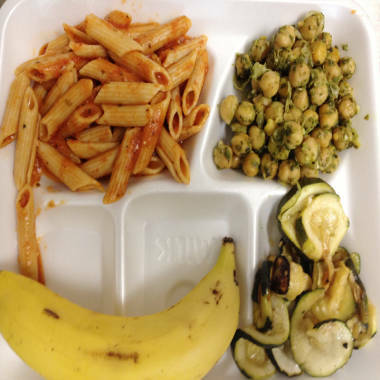 244 in Flushing, the Active Learning Elementary School, which opened in 2008, gradually started offering vegetarian meals more and more days a week, reducing the days per week they served traditional cafeteria food like chicken nuggets, said P.S. 244 principal and co-founder Robert Groff. "The founding of our school was based on health and nutrition and teaching kids how to make healthy choices in the belief that they would be more successful academically and in their life," Groff said. "But then we started to watch the kids. One, what they would bring in to school, and two, what they would gravitate towards in the cafeteria." Administrators noticed a higher number of vegetarian meals in the cafeteria, he said, partially because of the school's population: P.S. 244 is about 70 percent Asian and Indian. The switch to meatless — which the school did in partnership with nonprofit organization New York Coalition for Healthy School Food — was seamless. "Our head cook is also a vegetarian herself and a parent in the school," Groff said. P.S. 244, which serves 400 students from pre-kindergarten through grade three, went all-vegetarian in January, but was just publicly recognized by the New York city schools chancellor, Dennis Walcott, during a visit on Tuesday. “I am proud of the students and staff for trailblazing this extraordinary path,” Walcott said in a news release. Elementary schoolchildren at P.S. 244 in Flushing, Queens, enjoy a vegetarian lunch on Tuesday during a visit by New York Schools Chancellor Dennis M. Walcott. Other items on the menu at P.S. 244 include tofu vegetable wraps, vegetarian chili served with brown rice, and black bean and cheddar quesadillas served with salsa and red roasted potatoes. Each meal has the same amount of mandatory USDA protein requirements as their meat counterparts have in other public schools. Breakfast is also served, and that's vegetarian, too. Students start out their day with bagels and cream cheese, whole-grain banana bread, egg and cheese roll-ups, to name a few of the offerings from this month. "We know that when students eat a healthy diet, they're able to focus better. Their immune systems are stronger, so they're sick less, and then they're in school more and they're able to focus and concentrate better, and therefore learn better. There's research about that," said Amie Hamlin, the executive director of New York Coalition for Healthy School Food, which has worked with P.S. 244 for several years. Not all "typical" Department of Education meals have been removed from the cafeteria: Pizza Fridays are still on the menu, just without the pepperoni. Groff said most parents have greeted the changes warmly, and for those who haven't, he encourages them to send their children into school with their own lunches. "That, alone, providing the options for the kids makes the difference," he said. The move to all-vegetarian has been in parallel with New York Mayor Michael Bloomberg's citywide health efforts. "We've been watching how the mayor has been responding to something like sugary beverages or the smoking ban, and that was an opportunity for us, because we could see the direction the city is moving," Groff said. "We could move along with it to create the healthiest options for our kids."